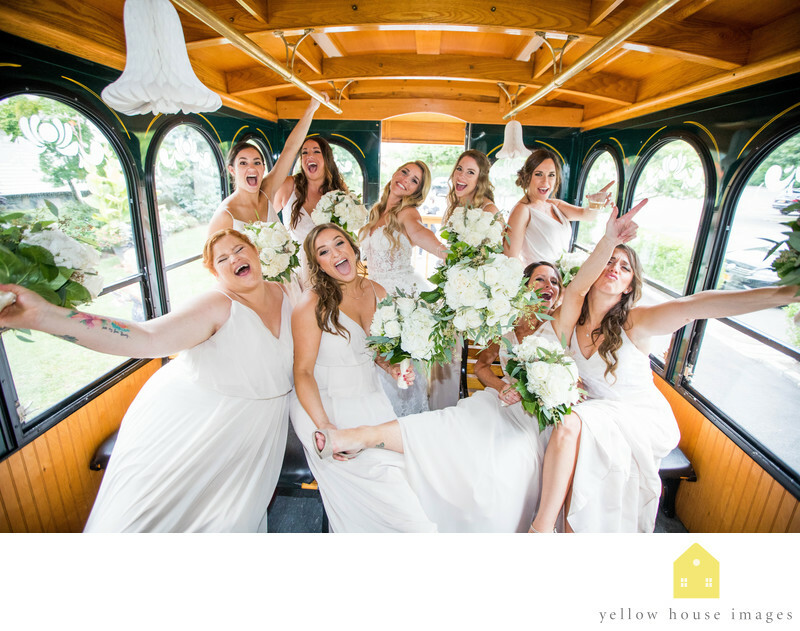 When planning transportation in and around Long Island for you weddings, the vehicle can make a great photo op. We love the use of Trolleys to give a fun vibe to any wedding party. Here we can see the girls enjoying a ride from their hotel on the South Shore of Long Island to the Watermill Caterers. These bridesmaids strike a pose in the back while we were parked outside the venue. The clean and comfortable interior leave plenty of space for do it yourself wedding decorations. It can also be used a space for downtime before a ceremony at a beach or nature-type spot that may not have proper shelter. It can also be be used as a great indoor spot for wedding portraits on a rainy day. This photo was taken with the Canon 17-35mm 2.8 wide lens to create space in the frame. It was taken with the Canon 1DX which we love because of the speed to catch the moments. Part of our Photojournalistic approach is taking alot of photographs. We also like to shoot with the highest speed cameras whether they are Nikon or Canon. A Profoto A1 flash was used to fill in the shadows as well. Location: 711 Smithtown Bypass, Smithtown , NY 11787.